Taste test: These large, triangular tortilla chips had a very tasty but not particularly hot jalapeno flavor, with a mildly hot lingering aftertaste. 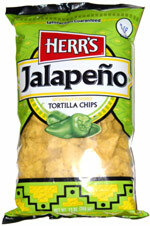 They were quite good, a popular choice around the chip bowl. The chips were on the brittle side and not particularly strong, so many of them were broken, and they might not work well for dipping. Smell test: Sort of a ranch seasoning smell, not noticeable jalapeño, nor any heat.